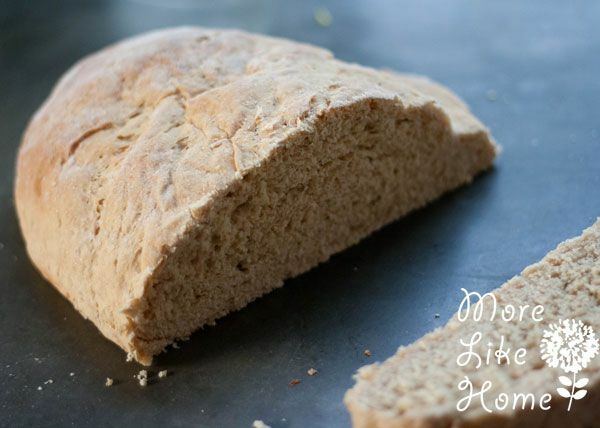 I searched around for recipes and finally decided to try this simple Everyday Whole Wheat Bread recipe. And just like that, it was everything I hoped for. Easy to make, yummy, and light yet sturdy. Melt the butter. Add warm water, 3 cups flour, honey and yeast (I use a large glass bowl). Cover the bowl with a clean dish towel and let it rise 30 minutes. I turn my oven on low and set the bowl on the stovetop so it stays warm enough to rise. Preheat the oven to 350°F. Uncover the bowl and add the salt and remaining 4 cups of flour and stir to combine (I find things tend to turn out dense for me when I use the full amount of flour so I start by adding 3 cups and then add more as I do it. I've had the best results when the dough is soft and almost sticky, and definitely not too firm). Knead on a floured surface for 1 minute, adding more flour if you need it. Divide the dough in half. Roll each half into a 12x9" rectangle. Roll the rectangle up and tuck the ends under to make a loaf shape. 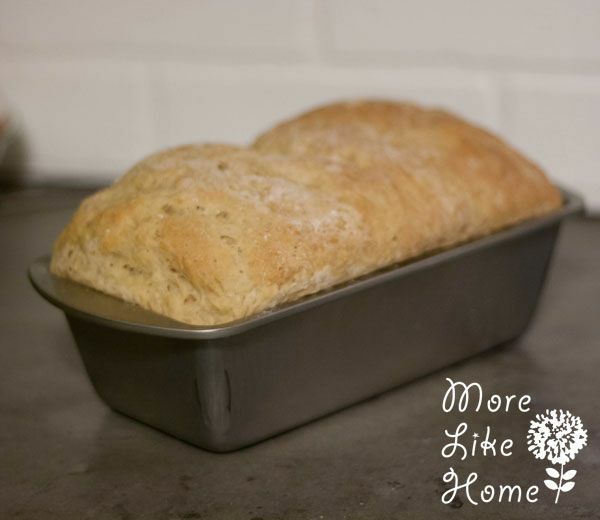 Put each loaf into a greased loaf pan (mine are from dollar tree and going strong!). Cover the loaves and let rise about 30 minutes until doubled in size (I set them on the stove top while the oven preheats). 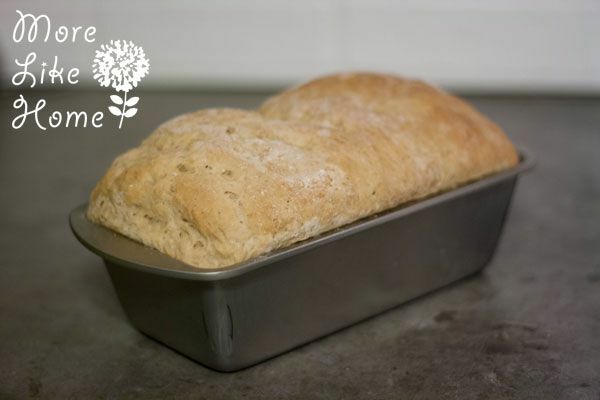 Place loaves in the center of the oven (be careful not to shake or drop the pans or your loaf will deflate. That means you, Beffy.) and bake 20 minutes until golden brown. It should sound hollow when you thump it with your finger. Devour with butter & honey. 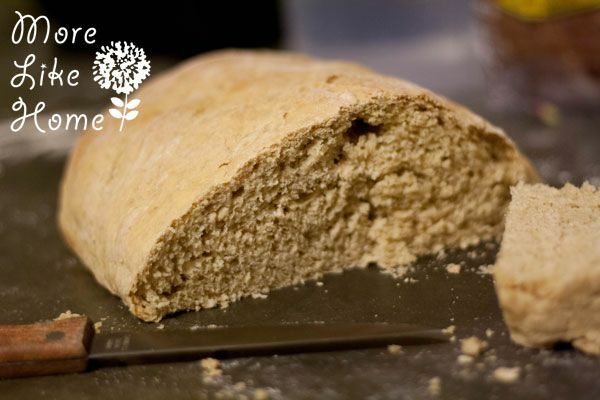 The original recipe called for making a more free-form loaf. I tried one loaf that way but made the second in a loaf pan and it turned out great so I'll probably be sticking with that most of the time. It seemed almost too easy to check that off my list... and after so much bread baking research I think it might have been? *cue sigh* I've been reading a lot about whole grains and how they contain tons of phytic acid. And it turns out phytic acid isn't great because it bascially stops your body from absorbing the vitamins and minerals it needs. Boo. But I also know this turned out really good, and I tend to take more of an "all things in moderation" approach. And this is still MUCH better for us than store-bought bread, so I'm sure we'll be making it vs. buying when we're in a hurry. 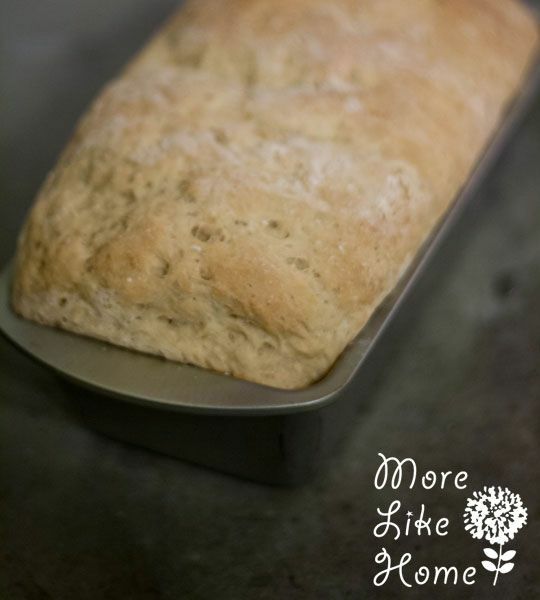 But when I have time to plan ahead a bit I'm going to try this Easy Soaked Bread recipe because soaking ahead of time is supposed to break down a lot of the phytic acid making it much easier to digest. I'll let you know how that turns out, but for now I'd say this is a great start to checking things off my goal list. When I was mixing up the dough I spotted Big Brother working on a sticker book in a cozy new spot. 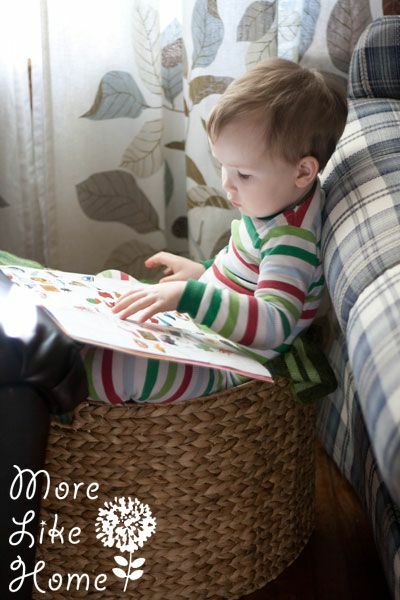 The blanket basket. He heard me snapping and said "take a picture of my stickers!" He got these sticker books for Christmas and I need to get some more ASAP. He went crazy for them! 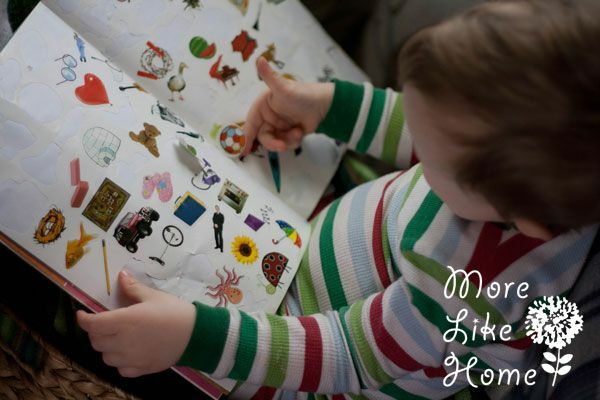 This one is an alphabet book that matches the stickers to the letter their first letters... and one of my goals is teaching him letters so maybe it will help. 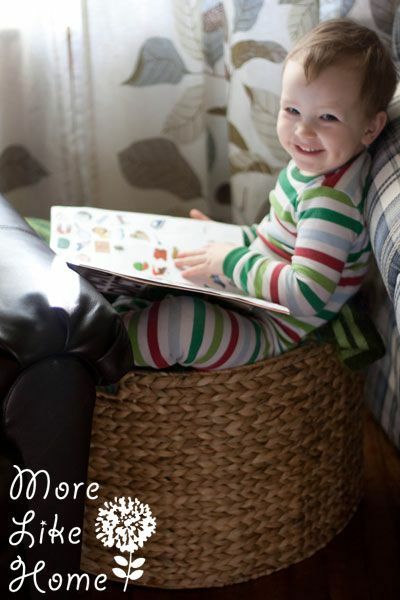 :) He has another book that has writing parts too, like drawing lines and circling things. 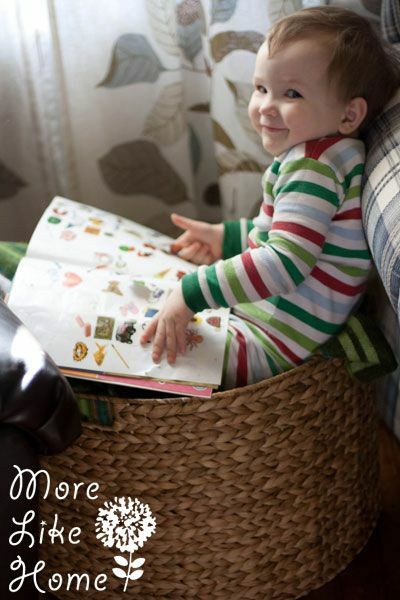 They have been keeping us very busy. Of course there's always time to be a ham. Seriously, guys. He's like the sweetest thing I've ever seen. What goals are you working on this year? Crossed any off yet? Have a bread recipe I need to try?